The Jatropha curcas plant (Jatropha) has been proposed as a source of biodiesel fuel, as it yields crude glycerol as an abundant by-product. Its by-products could serve as a starting material in making glycerol for FDA-regulated products. Jatropha is not regarded as a source of edible vegetable oil since it contains phorbol esters (PEs). PEs, even at very low exposure concentrations, demonstrate various toxicities in humans and animals, but may not be detected by routine impurity analyses. Here, we demonstrate the development of a rapid and simplified method for the detection and quantification of Jatropha-derived PE toxins using ambient ionization mass spectrometry. To do this, we successfully coupled a paper spray ambient ionization source with an ion trap portable mass spectrometer. 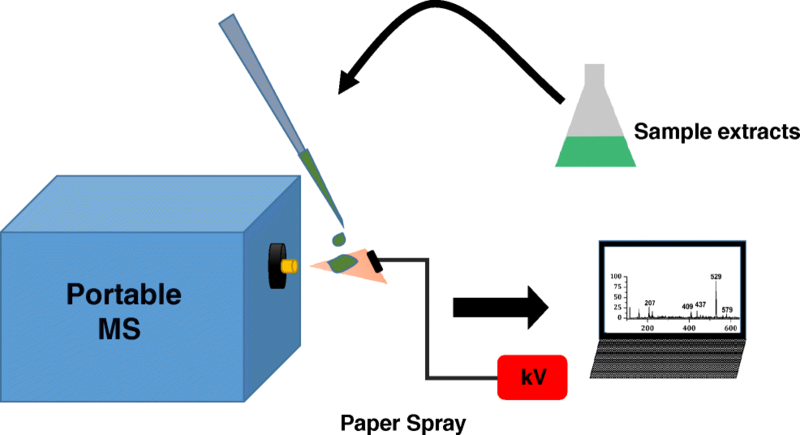 The paper spray source was assembled using chromatography papers, and analyte ions were generated by applying a high voltage to a wetted paper triangle loaded with PE standards. For method development, we used commercially available PE standards on an ion trap portable mass spectrometer. Standard solutions were prepared using ethanol with PE concentrations ranging from 1.0 to 0.0001 mg mL−1. Spike and recovery experiments were performed using USP grade and commercially available glycerol. To discern chemical differences between samples, we applied multivariate data analysis. 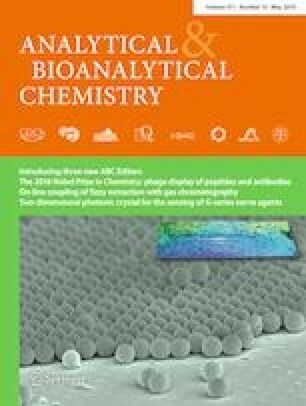 Based on the results obtained, paper spray coupled with a portable mass spectrometric method can be successfully adopted for the analysis of toxic contaminants present in glycerol-based consumer products with LOD and LOQ of 0.175 μg mL−1 and 0.3 μg mL−1 respectively. This direct, simple design, and low-cost sampling and ionization method enables fast screening with high sensitivity in non-laboratory settings. The online version of this article ( https://doi.org/10.1007/s00216-019-01717-1) contains supplementary material, which is available to authorized users. This project was supported in part by an appointment to the Research Participation Program at the Center for Devices and Radiological Health, administrated by the Oak Ridge Institute for Science and Education through an inter-agency agreement between US Department of Energy and the US Food and Drug Administration (FDA). Additionally, we would like to thank Dr. Steven Wolfgang from the FDA, Center for Drug Evaluation and Research, for his valuable guidance on the project, as well as Dr. Jose Centeno and Dr. Benita J. Dair, for their management support. The findings and conclusions in this paper have not been formally disseminated by the FDA and should not be construed to represent any agency determination or policy. The mention of commercial products, their sources, or their use regarding material reported herein is not to be construed as either actual or implied endorsement of such products by the US Department of Health and Human Services.